Get the convenience and advantages of a stairway on your grain silo with the BROCK SHUR-STEP® Silo Stairs. 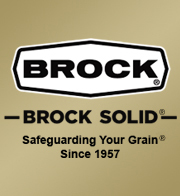 Brock's stairway can be used with stiffened or unstiffened silos, or silos with wind rings. The BROCK SHUR-STEP® Silo Stairway features wide, sturdy steps. Check the condition of your stored grain and roof-top mounted equipment without needing to climb a ladder. Would you like to be able to check the condition of stored grain and accessing roof-top mounted equipment without climbing a ladder? Now you can have the convenience and advantages of a stairs on your grain silo with the BROCK SHUR-STEP® Silo Stairs. Designed to meet or exceed relevant OSHA standards when installed properly. Follows the wall contour of the silo. Can be installed while the silo is being erected or added later. Stairs can be mounted to go either to the right or left around the silo. Stairs may be located to serve more than one silo. Also fits many other grain silos (15-foot/4.6-m diameter or greater) having 9-3/8-inch (238-mm) horizontal bolt spacing and 32-inch (813-mm) ring width. BROCK SHUR-STEP Silo Stairs – another reason more people are making their next silo Brock!